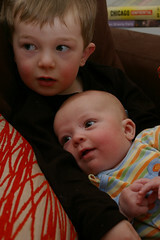 Finn is a great big brother. He's actually kind of obsessed with his "Little Bebs" and assumes that every time Cormac gurgles, " he's asking 'where's my Big Brother?'" IMG_0232.JPG, originally uploaded by lisabagg. Get a load of this! 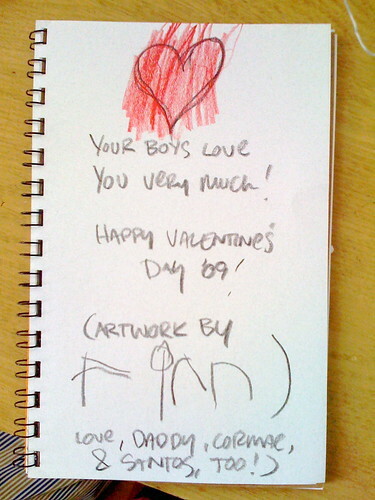 Daddy and Finn made me a book of photos and drawings for Valentine's Day. And the boy is so gifted that he even signed his own name as the very young age of three. He probably just let Daddy write the rest of it to feel good. "Mama, do you know how much I love you? Twenty-five." "I was all out of hugs and kisses. But then I went to Costco and got a whole bunch." [baby chirps up, and Finn yells from the other room] "I heard him! He just said, 'Where'd my big brother go?' Awww, that's so sweet!" Me: "Good night, Finn, I love you!" Finn: "No Mama, you've got it all wrong. I love you. I have been so bad at keeping the blog updated. I'm back to work now, and suffice to say, extremely overloaded. Here's a bunch of photos from Finn's best pal, Cal's, birthday party. Cake + inflatable jumpies = good times for the toddler set. Uncle Mike and Auntie Julie (or as Finn called them, "Uncle Julie and Uncle Crazy") were here this weekend to visit and meet their new nephew. It was great to see them, and no one was more thrilled than Finn. He could not wait for them to get up every morning and wouldn't leave their side when they did. He loved both of them, but it was Auntie Julie that he was totally smitten with. He would bombard her with hugs and kisses, crawl into her lap for cuddles, lovingly run his little cars all over her and follow her everywhere. He even said things like (after Julie had taken a shower), "It smells like Auntie Julie's... skin here." He had a big crush. But the cutest thing is what he said after dropping them off at the airport. He told Daddy that he didn't miss Uncle Mike and Auntie Julie anymore. When Daddy asked why, he said, "When I start to miss them, I just tell my brain to play a movie of their visit, and then I don't miss them anymore."